A s CIO, you can build a new, inte- grated innovation process: one that starts and ends with your custom- ers. A process that, with the help of project portfolio management, brings the voice of your customers to each step of the innova- tion process, from ideas, strategy, and scope to resources and delivery. You will deliver results and demonstrate value based on proof, not possibilities. Your customers are your most valuable assets; by making their input and ideas fully integrated parts of the innovation lifecycle, you will weed out inef- ficiency and drive all kinds of new growth. n Cloud computing is fostering new growth. Some organizations prefer to follow a sequential approach to development as part of an overall strategy to manage methodologies. 4 Execute and Deliver It's time to start building. Leverage different development platforms and methodologies. Match capacity with resources. Manage people working across the world negotiating different time zones and languages. • Develop the way you want: Agile, waterfall, or both • Plan work capacity and manage resource skills • Prioritize resources across methodologies 5 Collaborate, Track and Optimize Your Portfolio An integrated project portfolio management solution gives you a decision engine that powers your ability to innovate — and deliver. 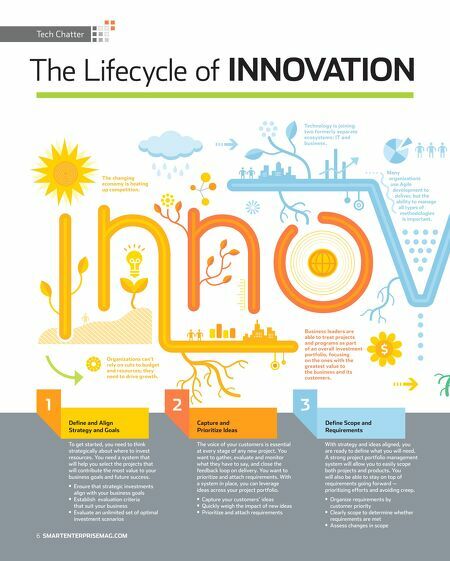 You can collaborate, track and optimize your innovation portfolio at every stage of the lifecycle. This closes the customer feedback loop: After implementation, you're already working on new innovations. 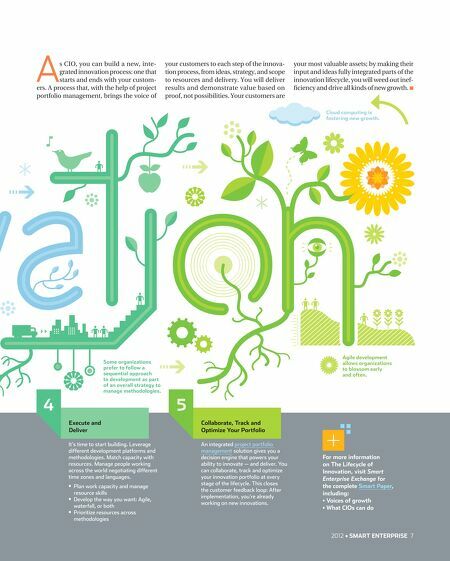 For more information on The Lifecycle of Innovation, visit Smart Enterprise Exchange for the complete Smart Paper, including: • Voices of growth • What CIOs can do 2012 • SMART ENTERPRISE 7 Agile development allows organizations to blossom early and often.